Carol Tompkins uses a combination of traditional design techniques and computer graphics to create her artwork for clients. This case study follows the initial design phases of a poster created while working in-house at the Pacific Science Center. After an initial meeting with her client to learn about the project, she created a pencil sketch of what the poster would look like. 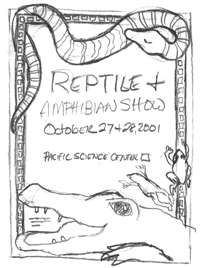 While photos of reptiles were going to be used to create the final artwork, a pencil sketch was a quick method used to get the basic design established. This rough comp was presented to the client for concept approval.